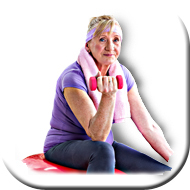 This area provides a range of products that are dedicated to improving the Health and Wellbeing of the aging community. Falls are the leading cause of injury related death and hospitalisation of persons aged 65 years and over, and Falls Injury Prevention has been identified as a priority area by governments world wide. The products in this section are designed to assist in improving balance and strength for everyday activities. This will allow the user to be more knowledgeable about their bodies and more skilled in performing daily functional tasks, from washing to lawn mowing, or from lawn bowls to golf. If you have poor balance or more serious health issues, you should only start using these products under the supervision of a health or fitness practitioner.